The surge of innovation in gynaecological cancer treatments is attracting all the major participants in the market for cancer drugs. Scientific advances are leading to the new treatment options in the market. Hence, the gynaecological cancer drugs market is also expected to see a significant growth in the coming years. However, in the diversified regulatory systems, the healthcare industry in most of the countries are still struggling to adapt and embrace new treatment options. Moreover, the absence of advanced diagnostic and treatment infrastructure and poor financing mechanisms especially in the developing countries is hampering the market growth. Gynaecological Cancer is still an area of active interest with increasing focus on targeted therapies. Several, targeted therapies are in the development process. Meanwhile, the concept of personalized medicine is gaining traction in the global gynaecological cancer drugs market with increasing number of clinical trials. 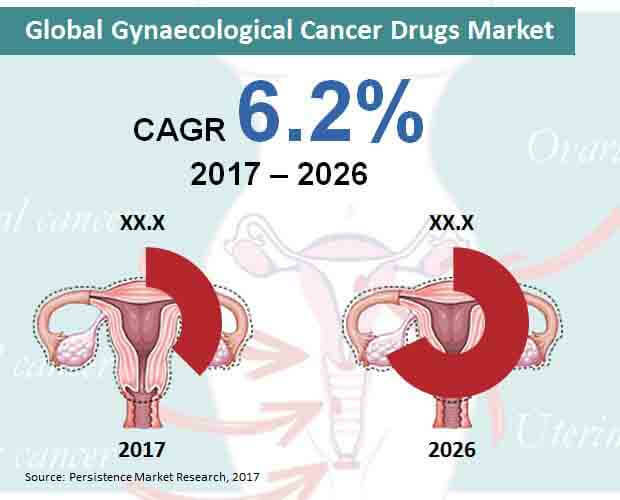 The report on the global gynaecological cancer drugs market offers key insights on various trends and factors driving the market. The primary and secondary research was done to derive at the various factors impacting the market growth along with the data on the market. The report also offers market segmentation and performance of the market in various regions. The report also includes both qualitative and quantitative information based on the opinions of industry experts, this helps in identifying opportunities in the market. The report also comprises CAGR, market share, year-on-year growth, revenue generated in the past and the forecast on the market from 2017 to 2026. The report also highlights current and upcoming trends, drivers, opportunities in the market and factors hampering the market growth. These market dynamics show the current scenario in the global gynaecological cancer drugs market. In-depth analysis of the drugs in the market helps in understanding future growth and opportunities in the market. Market attractiveness analysis sheds light on the investment opportunities in the market. A study also includes SWOT analysis and Porter’s five force analysis to get an idea of the overall market. The report also talks about latest developments and new technologies with the capacity to transform the market in the next few years. The leading market players operating in the global gynaecological cancer drugs market are also offered in the report. In-depth information on long-term and short-term strategies along with company and financial overview and product portfolio are also included in the competition analysis. The report also focuses on regulations imposed on the gynaecological cancer drugs market. The global gynaecological cancer drugs market is segmented on the basis of drug class, end users, indication, distribution channel, and region. The drugs class is segmented into alkylating agent, plant alkaloid, anthracyclines, antitumor antibiotic, and other drug class. Based on the end users, the market is segmented into hospitals, clinics, specialized cancer treatment centers, and other end users. On the basis of indication, the market segment includes cervical cancer, uterine cancer, ovarian & fallopian tube cancer, vulvar cancer, and vaginal cancer. Based on the distribution channel, the market is segmented into hospital pharmacies, retail pharmacies, and e-commerce. Region-wise, the market segment includes Latin America, Japan, North America, Asia Pacific Excluding Japan (APEJ), Europe, and the Middle East and Africa (MEA). Gynaecological cancers are being diagnosed among women on a large scale and are also emerging as one of the leading causes of death in various regions. There are various drugs available in the market to treat different types of gynaecological cancer. However, advanced cancer therapies and new drugs are being introduced with the increasing number of drugs currently in clinical trial and approval process. Among various drug class, antitumor antibiotic drug class is likely to gain maximum traction in the global gynaecological cancer drugs market. Antitumor antibiotic drug class is projected to surpass US$ 13,700 million in terms of revenue towards 2026 end. Antitumor antibiotic are being used on a large scale as it helps to stop or slow cancer cell for multiplying. Also, these medicines have proved to work well in treating cancer. Hospitals are likely to emerge as one of the largest end users of gynaecological cancer drugs between 2017 and 2026. Towards 2026 end, hospitals are projected to bring in close to US$ 16,400 million revenue. Availability of advanced cancer treatment diagnosis at hospitals are resulting in increasing number of patients. Moreover, increasing investment by government and the private sector in hospitals and presence of specialist surgeons is also resulting in increased number of patients, thereby leading to the increased use of gynaecological cancer drugs. Uterine cancer is likely to account for the largest share in terms of revenue between the forecast period 2017-2026. Uterine cancer is projected to reach close to US$ 22,600 million revenue by the end of the forecast period. Uterine cancer is the most common type of gynaecological cancer diagnosed among women. Hence, the discovery of new therapies and drugs is growing on a faster phase in order to treat uterine cancer. Moreover, endometrial cancer or cancer on the inner lining of uterus is the second most common type of cancer in women, especially in developed countries. Among various distribution channels, hospital pharmacies are anticipated to emerge as the largest distribution channel for gynaecological cancer drugs. Hospital pharmacies are projected to create an absolute dollar opportunity surpassing US$ 5,900 million between 2017 and 2026. Hospital pharmacies are the largest distributors of gynaecological cancer drugs because a lot of drugs are only approved to be sold by hospital pharmacies in the government hospitals. Moreover, the rise in generic drugs for cancer treatment is also driving the sales of gynaecological cancer drugs through hospital pharmacies. North America is projected to emerge as the major revenue generating market owing to the high prevalence of gynaecological cancer. By 2026 end, North America is projected to surpass US$ 14,700 million revenue. Meanwhile, Europe followed by Asia Pacific Excluding Japan (APEJ) are also likely to witness substantial growth in the coming years. Ongoing research and development and clinical trials of drugs in the U.S. are driving the market growth in the region. Key companies in the global market for gynaecological cancer drugs are GlaxoSmithKline (GSK), Johnson & Johnson (Alza Corporation), Dr Reddy’s Laboratories, Merck & Co., Bristol-Myers Squibb, Takeda Pharmaceuticals Co. Ltd., Pfizer Inc., Eli Lilly & Co., Sanofi, AstraZeneca, and Roche Holdings AG.